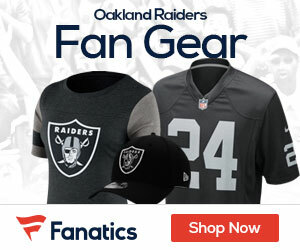 The 2011 NFL Draft kicks off within 24 hours and albeit it’s highly unlikely the Oakland Raiders will move up the board to the first round, there’s no shortage of excitement and speculation for the team’s second round pick (48th overall) and the direction that Al Davis and head coach Hue Jackson will take this weekend. The new man in office joined the organization as the offensive coordinator for Tom Cable, but this is Jackson’s ship this season and so far he’s put together a very good staff around him. Let’s hope the team pillars Mr. Davis to make some wise decisions. But if that doesn’t work, they can always tie him up to a chair, blindfolded and stranded during the event, until he’s able to return by the fourth round in time to select another speedster like Jacoby Ford. Oakland has held several private workouts for high-caliber prospects like the “Transformer” Colin Kaepernick of Nevada and Colorado’s cornerback Jimmy Smith. It’s uncertain whether either of these prospects will still be around at No. 48, but placing bets on that happening isn’t exactly all the rage in Las Vegas. I can’t see the Raiders passing on either of them if they’re available, but there are a few areas that must be addressed on defense, especially for depth. Moreover, in order to maintain the level that was implanted on the offensive side of the football last season, the most sensable direction with this selection is the offensive line. Robert Gallery is a free agent, so the center/guard position must taken seriously and upgraded early. Oakland invited Stefen Wisniewski last Thursday for a private workout and the coaching staff left happy, with their socks blown clean off from an extremely impressive performance. Wisniewski has blood ties with his uncle, who’s currently the team’s assistant offensive line coach. If he’s not still on the board, expect Marcus Cannon to be the pick. The versatile TCU offensive lineman can play tackle, both guard positions, and with his great strength, he would be an excellent fit for a team that loves to pound the football on the ground. Well, here comes a shocker, at least on the surface. But with Darren McFadden and Michael Bush’s past injuries on a contract year, it’s only fitting to introduce a young talent to emerge and add insurmountable depth. 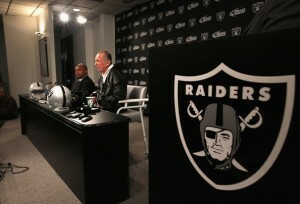 CBSSports.com is reporting Shane Vereen spoke with the Raiders running backs coach Kelly Skipper. Vereen chalked up 4,069 all-purpose yards in his collegiate career, despite leaving early as a junior for the 2011 NFL Draft. The California star has terrific burst to evade holes and cut lanes at the second level and this is the icing on the cake that makes Davis feel all warm and fuzzy about his decision. With Nnamdi Asomugha’s future uncertain and Michael Huff out of the equation, upgrading the secondary with a versatile defender has to take place early this weekend. Jalil Brown isn’t one of the quickest defensive backs, but he’s definitely one of the strongest and most experienced. The extremely physical three-year starter iat Colorado flourishes in jamming receivers off their routes from the line of scrimmage and looks to have what it takes to succeed in the NFL. Second-year pros Jared Valdeer and Bruce Campbell are very likely to start with the discharge of Cooper Carlisle and Robert Gallery, so continuing to boost the offensive line is the best route, here. Chris Hairston has quick feet, strength and the toughness to potentially develop into a starter down the road. The team had him for a private workout and liked what they saw with the big, lengthy tackle to fit into the offensive line. Oakland is in the market for a sufficient backup quarterback. The team doesn’t take a stab at the top prospects from this class, but grabs a steal and an excellent value in round 6 with a mobile, high-character, extremely productive scheme-diverse team leader. Smaller QBs don’t have a rich successful history in the NFL, especially when you refer to accuracy, but regardless, he’s a hard-worker with an enormously tall ceiling in terms of potential. Taylor is an excellent athlete with elusive big-play capabilities and recently put the idea of possibly playing wide receiver in the NFL to rest. The Raiders have two picks in the seventh and final round. They mind as well boost the young receiving core with these selections with a tight –end and a wide receiver. Both of these prospects have drawn interest from the Raiders. Thomas had official interview with the team at the combine. For the Raiders he may become an excellent playmaker in the Red-Zone due to his athleticism. He first needs to work on developing better route running for now he is a raw talent. Lockette ia a great overall athlete and will do well as special teams player. He has superb quickness and agility. Lockette is a straight line speedster and has best upside of becoming the Raiders return specialist where he can pull away from the pack. The Raiders simply don’t have a first rounder but that’s not going to stop them from gaining the player or player’s they need and want to develop into great NFL athletes. The Raiders are prepared for everything this draft while they sit down and play the waiting game for a bit. Coach Jackson and his staff are geared up and organized to give their owner the best draft in long time and take his team to the playoffs once again.